How would you like to play on a golf course that has just one hole, live mine fields surrounding it on all sides, a sniper tower just past the green, and is located on the boarder between two countries that have a history of fighting between them. 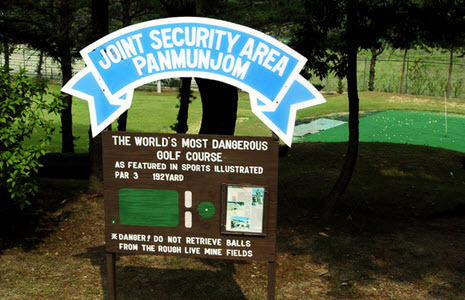 If this sounds like your “cup of tea,” you may want to consider taking a trip to Camp Bonifas’ golf course in Panmunjom, South Korea. Sure, flying halfway around the world (if you are from anywhere outside Asia) to play one round of golf consisting of a single 192-yard par-3 hole may not seem like its worth the price of admission, but how often do you get to enjoy the thrill of laying your life on the line while attempting to save par? 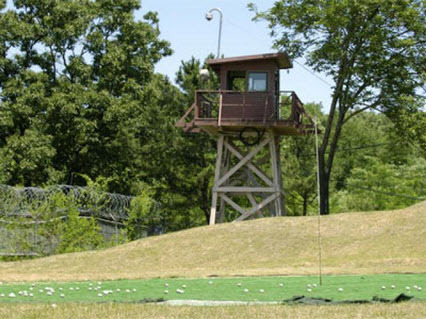 Camp Bonifas offers that type of adventure for the thrill-seeking golf fan. It was built in the demilitarized zone between North and South Korea in an attempt to provide the 50 soldiers stationed there with something to do as they help enforce the Armistice Agreement between the two conflicting sides. While no deaths have been reported on this course, rumor has it that one mine did explode following an errant shot off the tee. Suddenly, those shark and alligator infested golf courses in America and Australia don’t seem all that bad.